It’s funny that when the original Godzilla first took the world by storm back in 1954, who would have thought it would ‘inspire’ two remakes? One was back in 1998 and the other was just last month. But how do they fare as entertainment? The 1998 remake of Godzilla had an over-the-top hype machine behind it but it ended up being all action and no real story. Some of you may remember the 1998 remake starring Matthew Broderick, Hank Azaria and Michael Lerner. I remember it well too. One thing I remember most about the movie is that it relied too much on the special effects and action moments. That is probably the areas where it most delivered. Elsewhere it completely went downhill. At first it seemed like the right thing to hire Independence Day writer/director Roland Emmerich as director and co-writer along with Dean Devlin. However what the audience received as far as a story turned out to be a lot of ridiculous fluff. The story was typical and cliched. It stars off as a lizard-like monster is making its way to New York. A Japanese man knows it was warped that way by nuclear testing. Meanwhile in the Big Apple, Audrey, a news reporter who’s too nice to succeed over her backstabbing assistant meets her ex-boyfriend Nick, who’s now an agent. 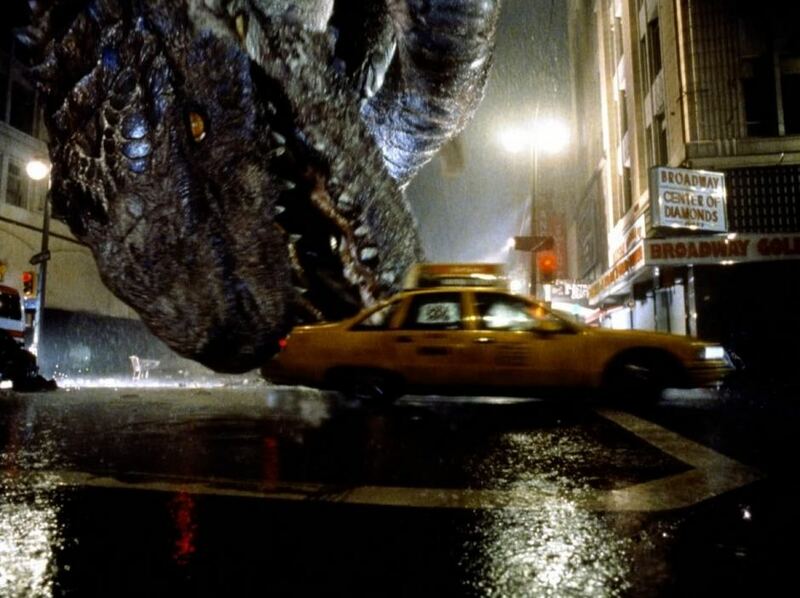 Once Godzilla attacks New York, everyone’s involved. Nick tried to get the case solved, the armed forces try to kill it, Audrey tries to get a big break out of it and win Nick back. The acting was very stockish and added to the ridiculousness of the movie. Even casting Maria Pitillo as Audrey turned out to be a bad choice because it made her look too ditzy and bimbonic, almost like a Minnie Mouse persona. Overall it was a ‘quantity not quality’ picture. It’s no wonder it was nominated for five Razzies including Worst Picture and won two including Pitillo for Worst Actress. Even today I cringe whenever I remember scenes from that piece of idiocy. The craziest thing about it was its huge marketing campaign. The film featured a CD which hit platinum and spawned a #4 hit for P. Diddy (then known as Puiff Daddy) with Jimmy Page ‘Come With Me.’ It also featured songs from some of the top hitmakers at the time like Green Day, The Wallflowers, Rage Against the Machine, Jamiroquai and the Foo Fighters. Taco Bell contributed $20 million to the campaign and even featured a special meal advertised by the Taco Bell chihuahua. There were even Godzilla toys marketed by Trendmaster which included a 11-inch Godzilla and a 22-inch Godzilla. So overall it was an overly hyped up movie intended to content for top box office honors. The hype machine behind Godzilla was spoofed in a Sprite commercial the following year shown in movie theatres where Hollywood execs are discussing marketing the movie ‘Death Slug’ with the script not even completed. The movie did succeed in making the Top 10 box office hits of the year with $136.3 million but it was only slightly over the $130 it cost to make and market. Internationally was slightly better with an additional $242.7 million. Congratulations, boys. Your hype-machine paid off. One thing to note is that the movie ended with a hint of a possible sequel coming. Fortunately it did not happen. Another couple things to note: Maria Pitillo retired from acting a few years later and Roland Emmerich would write and direct another piece of idiocy in The Day After Tomorrow. This summer came with the release of a new remake of Godzilla. Funny how there are a lot of movie remakes done these past few years; some remakes of movies done just ten years earlier. Before it was released, I kept thinking to myself: “I hope it’s not like that hideous remake from 1998.” When I saw it was certified fresh at Rotten Tomatoes (73% it cureently stands at), I decided to give it a chance. The 2014 version of Godzilla impressed critics more with the story and action moments. Unlike the 1998 remake, it doesn’t try to be a comedy-drama. Instead the story is much more dramatic, way more sensible and way better acted. Both the actors and writer Max Borenstein worked to deliver a movie that was very watchable for both the action scenes and the story lines. It actually worked in being a thriller. There were a few times in which I was waiting for a ‘fluff moment’ to happen. Okay, I’ll admit I hadn’t fully recovered from the phobia I had after the original remake. I found it very hard to remember a time during the film when I was left displeased. I won’t say that I was head over heels astounded with the movie but I was impressed with it to say the least. Oh, did I say that the Godzilla here looks way scalier too? I will admit there were times in which I was confused by the story or wondered if it was getting confusing. Both previous Godzilla movies strictly focused on Godzilla the creature in which he’s killed at the end. This was bizarre as Godzilla was not the only mutant creature but there were two others. I thought that was awkward at first. However I will give the writers and directors credit for developing a new unique story to the Godzilla franchise. Also good to see is that this new take to the story didn’t come off as corny as it could have ended up as. I won’t really say that this new Godzilla movie ‘did Godzilla right’ in comparison to the 1998 tripeload. Mainly because I haven’t seen the 1954 original and also when looking back, I think of areas it could have been done better. Nevertheless I will say this remake ‘did Godzilla better,’ way better than the 1998 schmaltzfest. And the best thing is there was no hype-fest with a CD or with a restaurant deal. If you remember back in the late-90’s, it was common for fast food restaurants to take part in the summer movie hype-fest by promoting movies with special meals that included images and ads of the movies on the packaging. I still remember Burger King doing promotions for 1999’s Wild Wild West and 2009’s Transformers: Revenge Of The Fallen: two over hyped dribblefests. Nowadays I don’t see restaurants hyping movies up anymore or not as often. That’s a relief. Let the summer movies sell themselves! 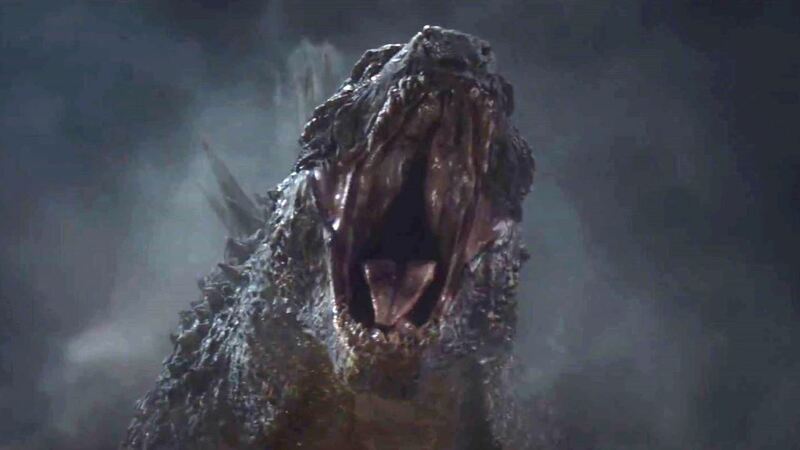 As for the biz of this new Godzilla, it cost $160 million to make, was hyped up way less obviously and has done well at the box office so far with almost $195 million to date and still stands in the box office Top 10 at #9 with $1.9 million last weekend. The most recent Godzilla movie is a much better remake than the 1998 fluff-piece in almost every way. Goes to show you that less can be more even during the summer movie season.